Have you ever wondered what exactly goes on behind the scenes at the Edmonton Convention Centre (SCC)? We’re publishing a series of articles on our blog that highlight some of the staff that work with and at our centre. In our last post, we met with Erin Clarke. She is one of the Pastry Chefs who bakes all the delicious breads and desserts that we serve to guests. For today’s post, we talked with Alejandro Falcon who has worked with us for five years. Safety is our priority, and as our Security Supervisor he ensures that guests, staff, and contractors are always safe and have a memorable experience. Alejandro (right) enjoying some lunch during a break from work. I work twelve-hour day shifts most of the time, from 7:00 am to 7:00 pm. When our security team arrives to the building, the first thing we do is have a briefing. We go over what happened the night before, what is going on that day, who will be in the building and where each event is taking place. Once this meeting is done, I will catch up on emails and then begin patrolling the floor. I check to make sure certain doors are locked, that fire exits are accessible and that events have been set up securely for when guests arrive. At around 2:30 pm, I have another meeting with administration. This meeting covers events that are going on in the building that might need extra security. My favourite part is having the opportunity to interact with different people at all the events we host, especially concerts. I also love the building and the great view we have of the River Valley. We have an amazing spot in the heart of the city! How do you and your team provide security to famous musical acts and speakers? We get direction on their personal preferences and requests from the Client Service Manager. Some want close security protection, while others like to be with their fans, in the public space. There are also some who are just here for their event and maybe a few photos, then want to be on with their day. We tailor our services to meet the kind of interaction they want to have. 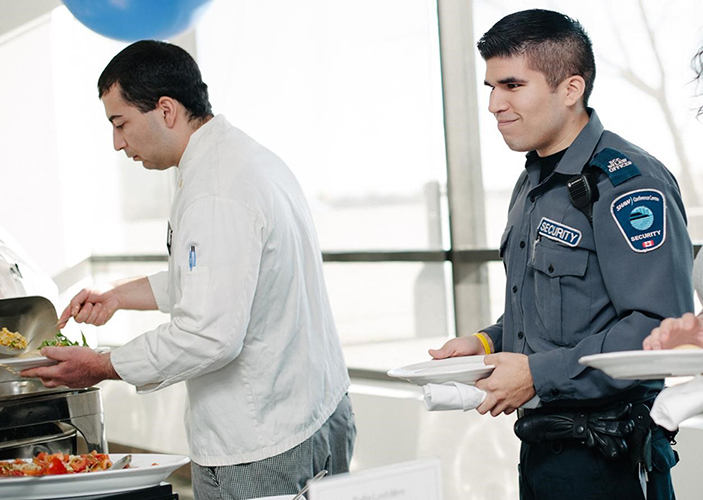 What training do new security hires receive to keep themselves and guests safe? All new hires complete the Pressure Point Control Tactics course, First Aid CPR Level C, AED Parking Bylaw training and a Cooperative Policing Course. What do you think makes a security team member stand out? Someone who is approachable, honest, likes to interact with people and is observant. What is the most stressful part of an event from a security standpoint? A couple hours into the event. It becomes crowded, and consumption of alcohol may cause people to lose their inhibitions. This may result in them being more difficult to communicate with. Contrary to what many people think, the end of the night moves quite smoothly. In general, people know that the event is over and it’s time to leave. What is your motto when it comes to security? Who are the most memorable figures you have met during your career at SCC? I’ve seen Hillary Clinton, Deadmau5, Marilyn Manson and George Bush. I don’t go out of my way to talk to them, but it’s cool to see someone famous right in front of you. How does your security team work with the Edmonton Police Service (EPS)? We work together closely. When an event is announced, our Client Service Manager forwards a security plan to the EPS. There is always police on site for any event, so someone from EPS will review the plan and then give us the resources they believe we need. Their decision is based on risk management factors. How many Security Agents are working at one of the concerts or Electronic Dance Music (EDM) events that take place at SCC? It is common to have 60-90 personnel working, depending on the genre and number of tickets sold. An all-night EDM event would have the most security, because there are so many hours to cover. These events can go on until 6:00 am. 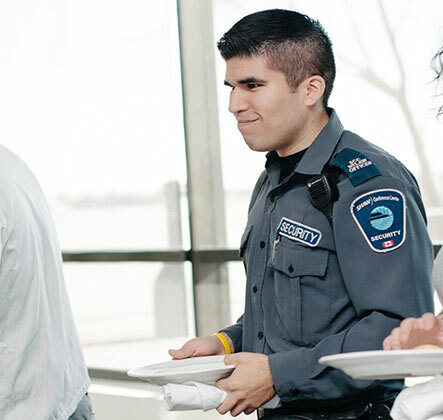 If you weren’t a Security Supervisor, what other position at SCC would you want to have? If I wasn’t a Security Supervisor, I would like to be a Client Service Manager. It would be great to work with the promoters and artists, to interact with them on a regular basis. 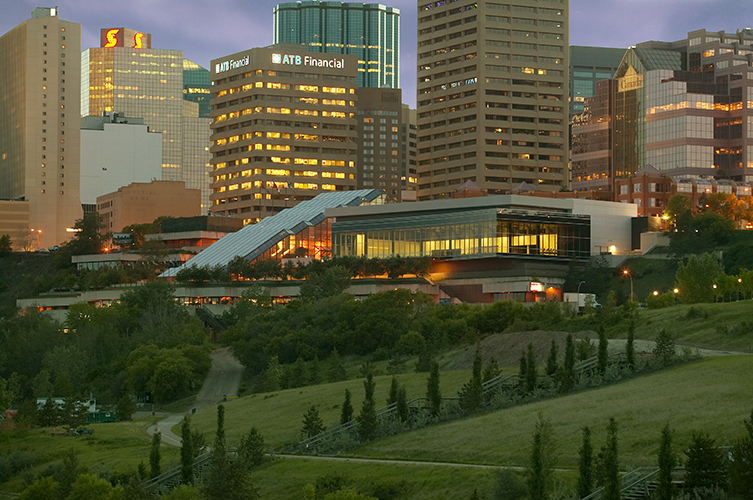 The Edmonton Convention Centre is renowned as a top training environment for young professionals wanting to move forward in their career. We are all very proud of Alex and wish him well as he begins his new career next month with Corrections Canada!